Time is conspiring against Skymark Airlines. Japan's third largest carrier is trying to execute a business change that is radical not just for itself but any low-cost carrier. Skymark has few recent successes to celebrate: the yen's depreciation is impacting costs while Skymark's business proves unfit for LCC competition and its future A330 deployment is repeatedly delayed, sending jitters to Japan's safety-conscious public. These troubles come after Skymark posted its first loss in five years at a not insignificant negative 2.9% operating margin. And that is just in the domestic market; internationally, Skymark publicly still intends to launch long-haul international flights with the A380, further elevating risk and complexity at what is already an unmanageable time. This is not likely to be fatal, although the to-do list is certainly long. This first of a two part report looks at Skymark's domestic operation. The carrier's success remains intertwined with Tokyo Haneda, where Skymark plans to grow at the slot-constrained airport by using larger capacity A330s. Their entry into service is delayed, but that is more due to Japan's slow-moving regulatory environment rather than any underlying fault at Skymark. Meanwhile competing against Japan's new LCCs at Tokyo Narita is proving fruitless; Skymark lost JPY3,449 million (USD32.7 million) on Narita routes in the last nine months of 2013. Routes have been cut but others remain while Skymark hopes it can break out from being stuck in the middle between full-service and LCC competition. Skymark is one of Japan's "new entrant" carriers allowed in the market in the late 1990s. It has since grown to be Japan's third largest domestic carrier behind All Nippon Airways and Japan Airlines, although Skymark is still a third the size of JAL. Skymark is for now solely a domestic operator. Skymark was able to ride on being Japan's alternative carrier until LCCs entered in 2012. Jetstar Japan's growth in coming weeks will see it become about half the size of Skymark, although Skymark's eventual introduction of A330s will later increase its size. Skymark's exact business model is perhaps best described as a hybrid carrier. Skymark offers more frills than the new LCCs, but less service or network than ANA or JAL. Skymark has tried to portray itself as a LCC, telling the market in what was a poorly communicated message that it would not necessarily respond to customer complaints, in order to save costs. With the A330 service and forthcoming A380s, Skymark is morphing into a full-service carrier, although considerable elements (network, loyalty programme) remain to be added. Skymark boasts a cost base significantly less than ANA or JAL but more than Japan's new LCCs. Its revenue also sits between full-service carriers and LCCs. This creates the opportunity to try to extract more revenue by offering a superior service with minimal cost growth – in theory, at least. Skymark first announced it would commence A330 services in the domestic market on 25-Mar-2014. This has been repeatedly delayed and the A330's entry into service date is now planned to be 14-Jun-2014, representing the fourth delay. This has brought unwelcome publicity to Japan, where safety is regarded with extreme care and interest. There are the further operational and marketing issues of repeatedly adjusting the launch date, impacting consumer confidence. The underlying cause is not a structural deficiency at Skymark. This is the first time Skymark is introducing an Airbus aircraft, and the first time the A330 will operate in Japan. While it appears Skymark has under-estimated the amount of preparation time, Japan's safety regulator also appears to be moving with limited speed. Skymark and the new LCCs do not have the same rapport with the regulator as ANA and JAL do, further creating delays. Skymark has already received its first two A330s from a total planned fleet of seven, covering four A330-300s and three A330-200s. Firm orders include those placed directly by the operator and by lessors assigned to the operator, from 2-Jun-2014 onwards. Tokyo Haneda is Skymark's largest airport destination by far, as is the case with ANA and JAL. Skymark's four largest routes are from Haneda, and overall five of its 10 largest routes are from Haneda. Haneda is slot constrained with limited prospects for increased capacity this decade. The government is mulling airspace changes that could increase capacity in the medium term. A fifth runway is being considered but this would not be ready until after the 2020 Tokyo Olympics. Haneda is the convenient Tokyo-area airport and services from there are prized. Skymark must grow at Haneda, not Narita. With slots constrained, the only medium available for growth is through capacity up-gauging. Skymark plans to deploy its A330s on trunk routes from Tokyo Haneda, replacing existing 177-seat 737-800 services. This begins to match ANA and JAL's use of high-density widebody aircraft in Japan's domestic market. Skymark has under-utilised its Haneda slots, with each of its Haneda slots providing 177 seats compared to 246 from ANA or 214 from JAL. Skymark holds 7.1% of Haneda's slots but accounts for only 5.7% of seat capacity at Haneda. Skymark's 737 fleet is in an all-economy configuration of 177. For its A330s Skymark is taking a different approach by outfitting the aircraft in an all-premium economy configuration seating 271. The seats will be seven abreast in a 2-3-2 configuration compared to the A330's standard economy configuration of 2-4-2 or high density 3-3-3 configuration. Skymark's reckoning is that its lower cost base than ANA or JAL will allow it to sell its premium economy seat at about the same price as ANA or JAL's economy seats. Skymark is offering perks in its A330 seats with wide tray tables and powerports to facilitate work. ANA and JAL operate their domestic aircraft in tight configurations (10 abreast on the 777 for example), and not even JAL's new domestic product offers a powerport in "Class J". 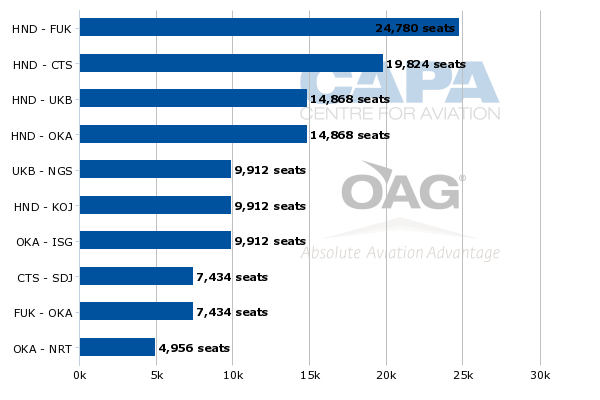 CAPA has previously analysed the rationale for Skymark's A330 operation. Now that the A330 operation is moving closer to launch – and a year has passed since the product was unveiled – there are new moving parts to the equation. JAL has mildly refreshed its domestic product while ANA has not announced any changes, taking the view JAL has caught up to, not exceeded, ANA's product. With Skymark's A330 services now on sale, there are questions if ANA or JAL would slightly undercut Skymark's fare. Some believe companies require travellers to purchase the lowest fare and would be unable to justify a slight premium on Skymark despite a significant increase in comfort. However, a spot check on fares shows ANA and JAL are at least JPY20,000 (USD194) from Tokyo Haneda to Fukuoka, significantly more than Skymark's JPY12,200 (USD118). However, it remains to be seen what pricing dynamics will emerge for fares bought closer to departure. Arguably the bigger question is whether a premium product on relatively short one-hour flights will attract more passengers. While Skymark may be able to offer more comfort for a lower price, it does not have the network and frequent flyer programme ANA and JAL do. Loyalty programmes create stickiness. Skymark holds well on its major routes, offering 10 flights a day between Haneda and Fukuoka, although this is less than the 28 daily flights ANA offers. 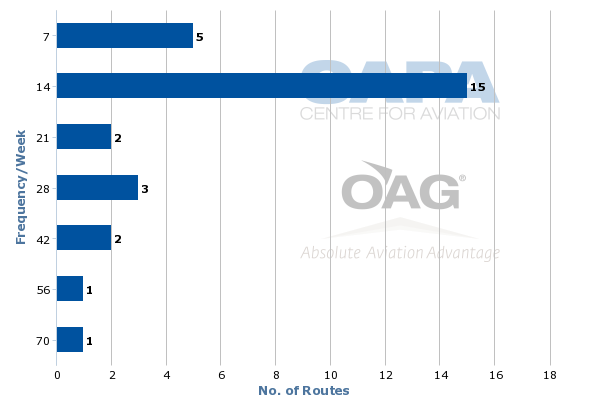 But on smaller routes Skymark's frequency decreases: 20 of its 29 routes have at most double daily service. The A330 project however arrives at a delicate time, strategically and financially. In the last nine months of calendar 2013 (the only data available), Skymark said the A330 and A380 projects cost it JPY919 million (USD8.7 million). The A330s will also increase Skymark's cost base. But there is no guarantee yield will increase. Rather the A330's objective is to help Skymark grow volume which it could not do without larger aircraft. Profit growth may arrive with the tradeoff of lower margins, presenting risk and lower room for error. The A330 and A380 projects are one contributor to Skymark's significantly weakened financial results for FY2013, the 12 months to 31-Dec-2013. Skymark reported an operating loss of JPY2506 million (USD25.0 million) compared to an operating profit in FY2012 of JPY4674 million (USD46.6 million). Skymark's operating margin fell to negative 2.9% in FY2013, an 8ppt swing from a positive margin of 5.4% in FY2012. Revenues were flat, in line with flat passenger (6.7 million) and seat capacity (9.8 million) figures. Costs increased by 9.9%, including a 12.7% increase in fuel costs. Total liabilities: JPY34,082 million (USD340 million). Skymark's increase in CASK was unfortunately paired with a decrease in RASK. 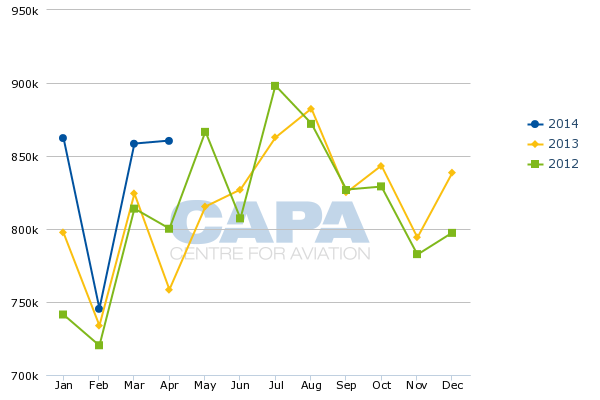 Skymark's decrease in RASK by about 1% was lower than ANA's domestic RASK decrease of 2.7% and JAL's 2.6% decrease. ANA and JAL however were able to offset domestic weakness with strength in international markets. ANA plans to follow JAL's strategy of having more international than domestic capacity. While there could be elements of that thinking in Skymark's international plans, Skymark has not even captured a sustainable domestic position that could support an international network. There were a number of factors in Skymark's FY2013 loss. One prime reason was poor performance at Tokyo Narita, which is home to two LCCs – Jetstar Japan and Vanilla Air – and soon a third in the form of Spring Airlines Japan. In the last nine months of calendar 2013, Skymark says it lost JPY3,449 million (USD32.7 million) on its Tokyo Narita operation. 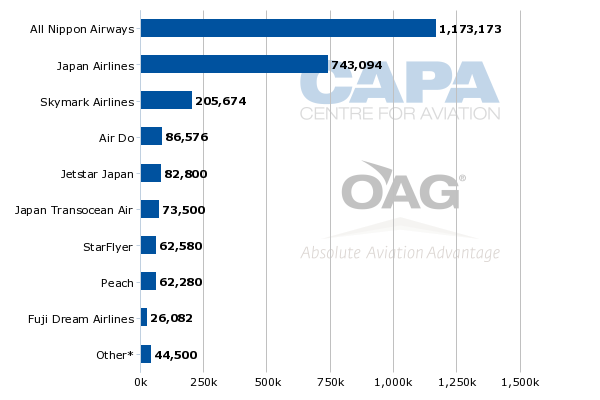 Skymark's largest losses were to Okinawa Naha, which is also Skymark's longest route from Narita. 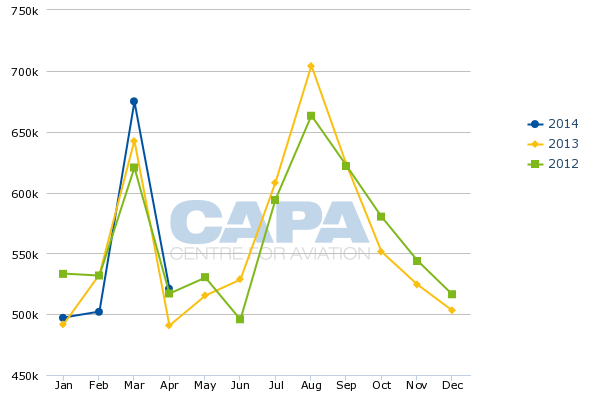 Skymark in the last nine months of calendar 2013 averaged a 58% load factor according to traffic statistics. This was an improvement from the corresponding period in 2012 that saw a load factor of 53%. 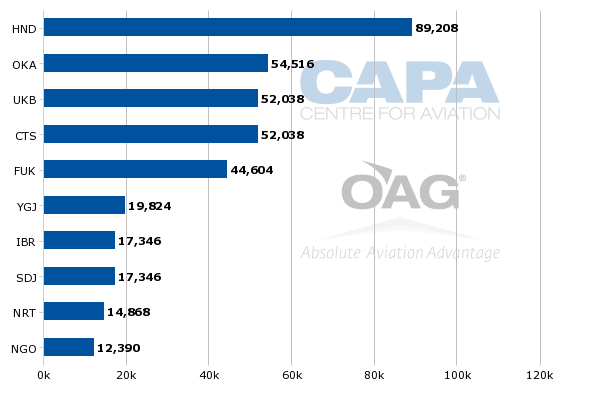 However, 2013's figure was below Skymark's system average load factor of 68%. The Narita-Okinawa route's load factor of 58% was also significantly down from Skymark's Haneda-Okinawa load factor, which in the same period was 76%. 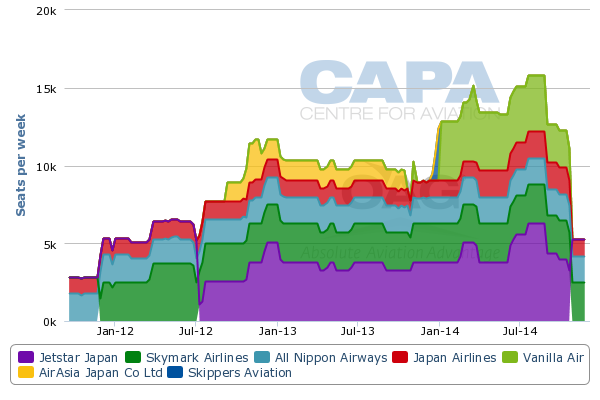 Skymark's Narita performance dragged down the average. Skymark's figures indicate it carried approximately 70,000 passengers between Narita and Okinawa in the last nine months of calendar 2013 at a loss of JPY17,000 (USD165) per passenger. The route attracted increased competition from Jetstar Japan, and further competition in 2014, with the launch of Vanilla Air. While the Narita-Okinawa route remains, Skymark has ended service from Narita to Asahikawa, Fukuoka and Ishigaki. Fukuoka is served by Narita's LCCs while Asahikawa and Ishigaki are not. This indicates that where LCCs are present, Skymark cannot compete on overlapping airport pairs (Skymark continues to hold an advantage by operating out of Haneda). The lesson from Skymark at Tokyo Narita sums up its general outlook. Skymark does not have a cost base low enough to stimulate traffic to new destinations the way LCCs do, and nor does it have the scale and other component (loyalty programme, for example) to attract passengers the way ANA and JAL do. LCCs have a limited presence in terms of their number of routes, primarily focusing on flights to and from Tokyo Narita (Jetstar Japan, Vanilla Air and Spring Airlines Japan) and Osaka Kansai (Peach). But as the LCCs add bases (and AirAsia Japan is expected to launch at Nagoya), the opportunities for Skymark decrease. This scenario will cause problems for Skymark should it take on an A380 operation as the airline stands today. A lack of partners, loyalty programme and clear positioning will hurt Skymark's A380 prospects. If the consequences Skymark is experiencing in the domestic market are replicated on an international long-haul network, the outcome will be severe. Long-haul can become loss-making very quickly, even endangering the existence of the company. Yet at the same time, the factors hurting Skymark domestically could be reversed and boost, but not necessarily secure, the prospects of an international A380 operation. Skymark's domestic operation is fixable, ensuring Skymark can continue to have an important role in Japan's domestic market. Skymark can balance, and even further challenge, ANA and JAL. But Skymark's history and future potential will be forgotten if its long-haul operations drag it down financially. Skymark's A380 operation will be examined in the second part of this report.